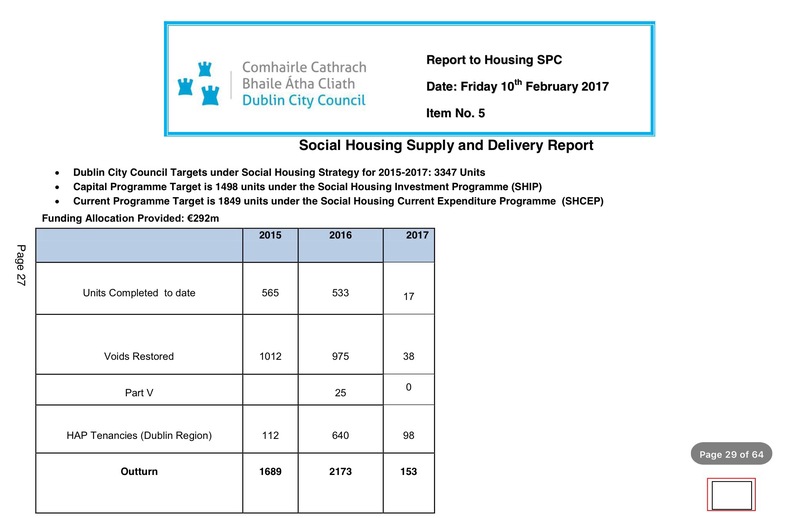 Following the allocation of almost €18 million by the Government for the construction of 56 social housing units before Christmas, the City Council is completed an assessment of the design of the units as provided for under the An Bord Pleanala planning permission. That assessment identified the need for some tweaking of the design of the units so that they comply with the updated Building Regulations.The Council will also have to facilitate the relocation of an existing ESB sub-station in order to ensure that electricity continues to be provided for remaining residents in O’Devaney Gardens. The Manager also confirmed to me that a programme of works for the construction of new housing on the O’Devaney Gardens site will be provided to me by the middle of next month. The City Council has been working on ensuring that additional housing can be provided on the Croke Villas site. A total of 74 units are being earmarked on Croke Villas and Sackville Avenue. A capital appraisal for the project, which is necessary in order for funding to be sought from Government, is expected to be finalised shortly. Following the granting of €1.7million in funding from the Government, Dublin City Council selected a contractor, who subsequently, pulled out of an agreement reached on costs. The contractor who was next on the tender list has since agreed a Programme of Works with the Housing Department. This means that construction work will now begin on site along Ballybough Road by Wednesday, February 15th next. Over the coming months, I will share further updates on various housing projects across the North Inner City. Please get in touch with either myself or Minister Paschal Donohoe if you have any questions or queries about any of the projects highlighted above. This entry was posted in Arbour Hill, Ballybough, Clonliffe Road, Montpelier, Stoneybatter. Bookmark the permalink.